Until moving to Minnesota, I didn’t have an appreciation for state fairs.The Minnesota State Fair changed that in one visit! The Minnesota State Fair also known as the Great Minnesota Get-Together is the second-biggest fair in the country and always ranks as one of the United States’ best state fairs. It last for 12 days and averages 1.8 million visitors annually. And this year’s fair is special because it’s the 130th anniversary of the Minnesota State Fair being at its current location; mid-way between Minneapolis and St. Paul. The Minnesota State Fair begins on August 27th and ends Labor Day, September 7th. To an outsider, th e MN State Fair may appear only to be comprised of deep fried food, foods on-a-stick and carnival rides but it’s so MUCH MORE! It’s 12 days of entertainment, attractions, education, special exhibits, agriculture, and exhibits. 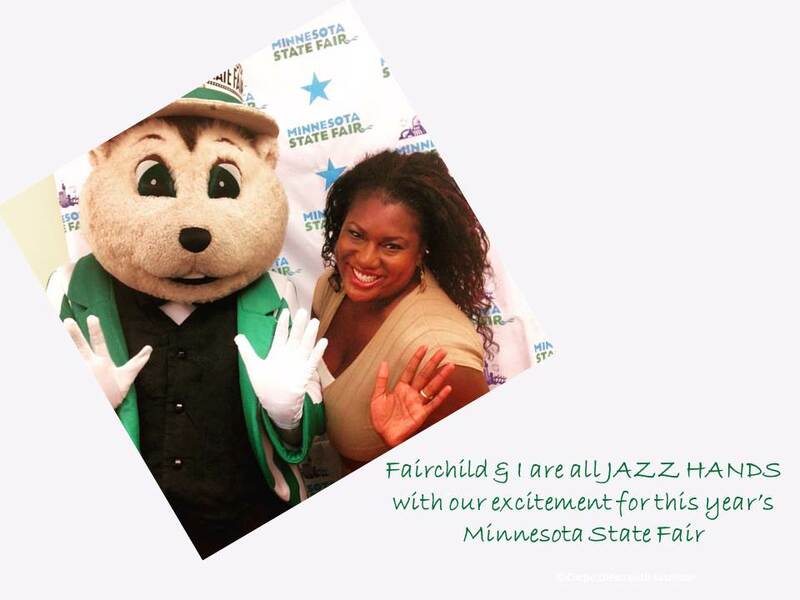 I was invited to attend a special preview for bloggers of this year’s Minnesota State Fair last week called, the Great MN Blog Together where I got to meet Fairchild the Gopher, the mascot of the MN State Fair; learn about the some of the new and family-oriented exhibits and taste a few of this year’s NEW food items. What a fun afternoon! Here’s a list of my favorites at the Minnesota State Fair and some of the things I’m looking forward to seeing and tasting that this year’s Great Minnesota Get-Together. Nearly 200 calves lambs and piglets will give birth during this year’s Minnesota State Fair. The CHS Miracle of Birth Center is a one-of-a-kind agricultural education exhibit and the most popular free exhibit at the Great Minnesota Get-Together. Sponsored by the Midwest Dairy Association features butter sculptures of Princess Kay of the Milky Way, and her royal court carved into 9-pound blocks of butter; an All-You-Can-Drink Milk Stand and the Dairy Goodness Bar. This year the Dairy Goodness Bar will feature a new treat called the “Flavor of the Fair.” The inaugural “Flavor of the Fair” is a Salted Caramel Puff malt or sundae. The Salted Caramel Puff malt or sundae is made with Minnesota dairy farmers’ secret State Fair recipe vanilla ice cream or malt, topped with creamy caramel sauce and finished with the perfect crunch of Old Dutch Puffcorn. 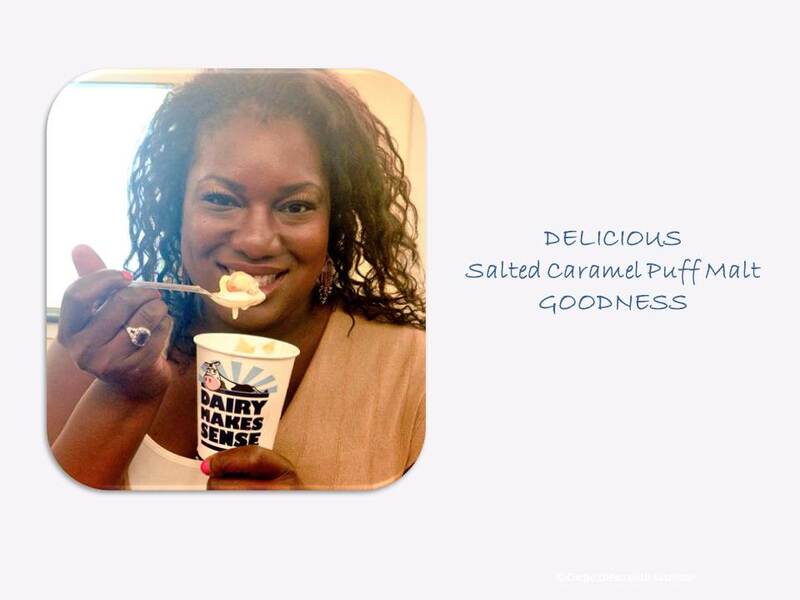 I got to try it at the Great MN Blog Together and it SO GOOD! I can’t wait to get another. Is one of Top 3 Favorite exhibits at the Minnesota State Fair. It’s a showcase of projects and artwork by Minnesotans that showcases agriculture, horticultural and bee culture activities from around the state. 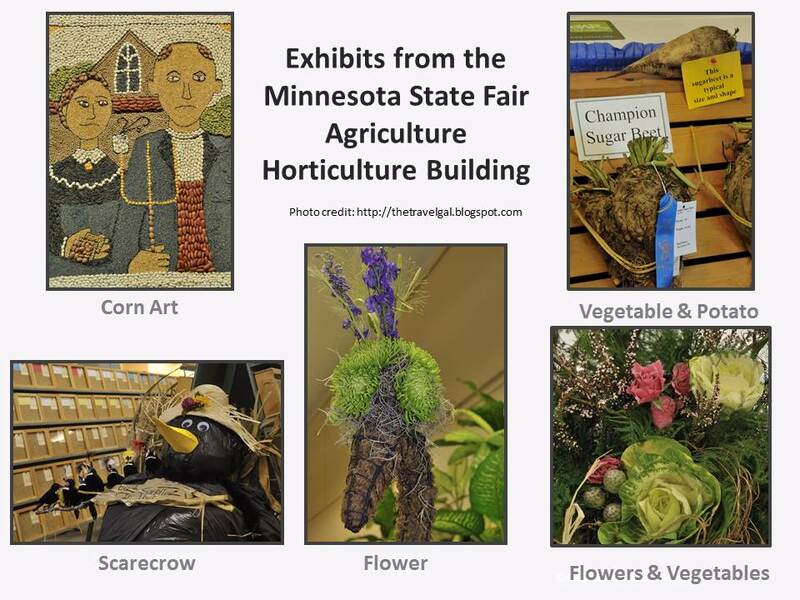 I highly recommend the crop art and scarecrow exhibits; flowers and vegetable and potato exhibits. A new exhibit sponsored by the Minnesota Historical Society that brings Minnesota history alive with a fashion parade showcasing state symbols. Participants can also participate in the Cereal Bowl Trivia Quiz hosted by Betty Croker and mingle with special guests like Paul Bunyan, Dough Boy, and Snoopy. Sticking with the-on-a –stick theme the fair has added Math On-A-Stick as a new exhibit for 2015. 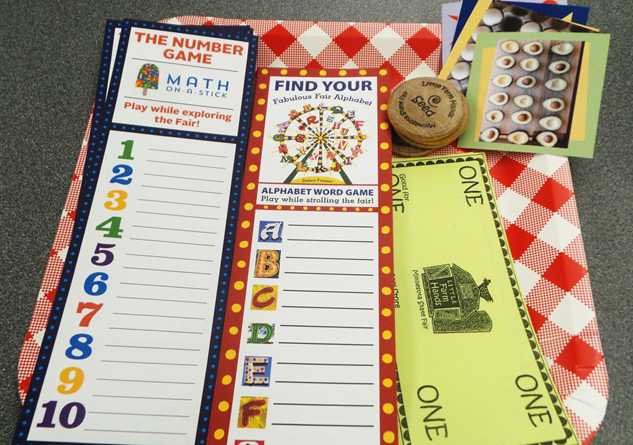 It’s a welcoming space where kids and grown-ups can explore fun math concepts at the fair. The exhibit features the fun geometric and reptile shaped tiles that fair attendees can use to create designs and patterns. I’m not sure how I’ve missed this exhibit before. It’s filled with photo opportunities, books, and crafts. 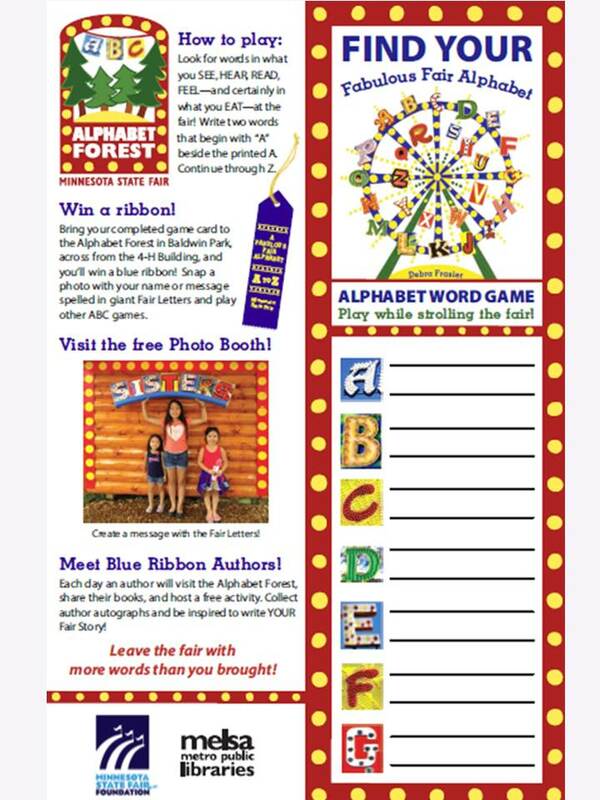 There’s a game called the Fabulous Fair Alphabet Game that allows players to win their very own BLUE RIBBON! It’s not a state fair without live entertainment! This year’s Grandstand lineup includes Def Leppard, Keith Urban, Carrie Underwood, Patti LaBelle and the Commodores, Alan Jackson, and MORE. Plus, there are nightly fireworks each night after the Grandstand shows. The Minnesota State Fair also offers FREE daily entertainment at the Leinine Lodge Bandshell, Bazaar, Schell’s Stage; Ramburg Senior Center; Baldwin Park; The Garden Stage; and The Festival of Nations Demo Station. This year’s free concert series includes personal favorites like Andy Grammer and Davina & The Vegabonds Concert and ticket information is available online at the Minnesota State Fair website. Fried food and food-on-a-stick go hand and hand with the Minnesota State Fair. 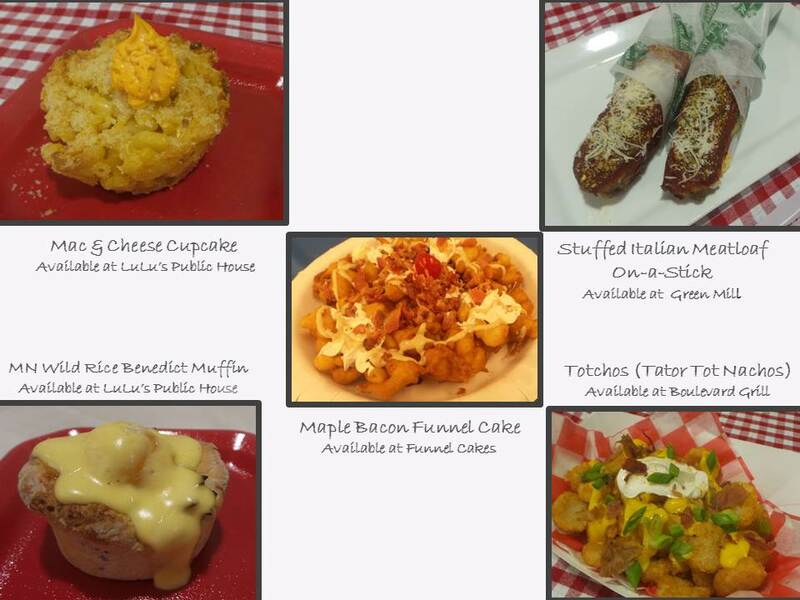 At the Great MN Blog Together I got to try some of the 40 new food items that will be available at this year’s fair. A few of the NEW food items that I recommend are- Grandma Deb’s Snicker Bar Salad from the Blue Barn. Who knew that anything with cool whip and pudding could be considered a salad? Lulu’s Public House’s Mac & Cheese Cupcake. What an ingenious idea and very tasty! Stuffed Italian Meatloaf On-A-Stick from Green Mill. The pepperoni adds a nice kick to the flavorAnd I won’t be leaving the fair without the classics like, funnel cake, pork chop on-a-stick, fried pickles, yellow bucket French fries and Sweet Martha Cookies. The Minnesota State Fair is an end of summer ritual. I think an outing to the Great Minnesota Get-Together is a wonderful way to seize the day with kids, parents, friends or yourself. It’s a one-of-a-kind celebration of everyone and everything in Minnesota. Who knows I may even see you there! It truly is The Great Minnesota Get Together, isn’t it? Great comprehensive list of the Fair! Have a wonderful time! This is super cool, Jasmine! 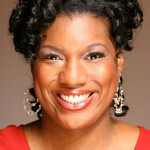 I also watched your tv clips – you are a natural! I’m so impressed.